"Did I see the word 'jazz' somewhere?" 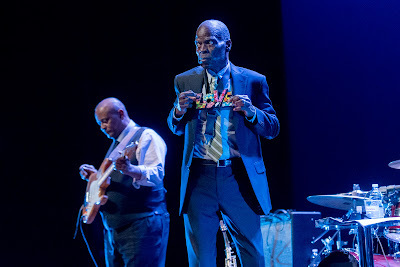 Maceo Parker looks round and "notices" the huge illuminated onstage logo, "Bergamo Jazz 2018". So he concedes: "We're going to play some jazz – music that we do not [normally] play". It turns out to be just one chorus of Satin Doll, played very fast. This was very slick entertainment indeed – the band even has a professional "introducer" who comes on at the start and end. Their long set was a highlight of the stellar programme created by festival director Dave Douglas. This 40th edition of the Bergamo Jazz Festival was fully up to the standard of previous years, but I don't think the others on the bill would dispute that the greatest entertainer among them is Maceo Parker, with his tribute band to James Brown, Marvin Gaye, Ray Charles and George Clinton. At first Parker seemed to show his age a little – he's 75 – or maybe he just needed time to warm up. Soon he's totally sharp and fully choreographed, in what is a truly remarkable and ageless performance – the first number ends with the band members in an amazing extended "freeze". I imagine that the set list stays fairly constant. Parker describes his music as "two percent jazz and 98 percent funky stuff" and though that's an exaggeration – the jazz element is higher – underlying it is the aesthetics of perfection, honed and crafted, of a consummate entertainer. Dennis Rollins on trombone is a key figure, together with Rodney "Skee" Curtis on bass, an old colleague of Parker’s in the P-Funk All Stars, and keyboardist Will Boulware. Guitarist Bruno Speight and drummer Nikki Glaspie, a recent member of Beyonce's touring band, complete the line-up. Parker’s cousin, Darliene Parker, is the vocalist, featured on Ben E. King's hit Stand By Me, with the leader on flute. The motto was "It's All About Love". The set included James Brown's Make It Funky, a vocal medley including Some Enchanted Evening, and a Marvin Gaye medley. Rollins and Boulware duet on When I Fall In Love, provoking more reminders from the leader that the show is "All About Love". The encore was Pass The Peas, a blues, and the coda was Over The Rainbow. Maceo Parker aimed to please the audience, offering classic entertainment. 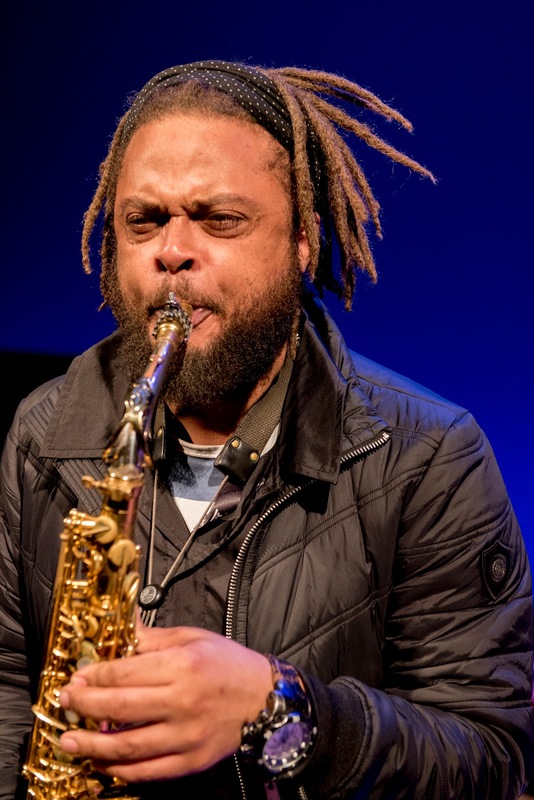 That aim wasn't a priority for Logan Richardson, whose quartet of saxophone, electric guitar, electric bass and drums opened the festival in the Teatro Sociale. This was a more challenging aesthetic by a quartet with attitude, addressing more contemporary forms of African-American music. The leader began by complaining at length about an onstage microphone that couldn't be turned off – which turned out to be an irrelevance, given the volume levels when they finally started. The bass drum sliced through the wall of sound, cutting the ears to the quick. The saxophonist's recent work with Pat Metheny and Nasheet Waits has been much-praised, and clearly these guys can play. But this material was mediocre. Richardson was the only serious disappointment of the festival. On the Saturday afternoon, in-demand bassist Linda May Han Oh – an Australian born in Malaysia – led her own group featuring tenor saxophonist Greg Ward, guitarist Matt Stephens and drummer Arthur Hnatek. These are clearly remarkable improvisers, and Linda Oh has been a wonderful bassist with Lee Konitz and others. Though her compositions don't immediately pull the listener in, one that did is Speech Impediment, with a stuttering drum opening. A delight of Bergamo is the variety of historic buildings explored as venues. Trumpeter Jeremy Pelt delivered an exhilarating set in the medieval space of Sala All Porta di S. Agostino, part of the old town wall. The band featured Victor Gould (piano); Richard Good (bass), standing in for Vincent Archer; Jonathan Barker (drums) and Jacqueline Acevedo (percussion). Pelt, born in California in 1976, belongs to the post-modal mainstream. His set suggested the kind of music that Woody Shaw would be playing today – obviously indebted to Miles Davis, in a lineage going back to Louis Armstrong, but strong and individual. Compositions included Black Love Stories, a mid-tempo/ballad, and the Milesian uptempo Sir Carter, composed by pianist Victor Gould for Ron Carter. The material is perhaps more conservative than Linda Oh, but somehow more involving. It's a sign of the richness of American jazz that Jeremy Pelt is still a talent deserving wider recognition. Louis Sclavis and Vincent Courtois played an intimate set in the thoroughly appropriate context of a gallery of the Academia Carrara, the city's wonderful main art gallery. I've not been a huge fan of Sclavis's band projects, but this performance brought out his virtues as a improviser, in which he switched between clarinet and bass clarinet. The opening piece, which featured bass clarinet, was rather baroque; the one that followed involved more pointillist free exploration, eventually turning into a jaunty 6/8 dance. The closing concert featured the band of Dave Douglas and Uri Caine, featuring a three-trumpet frontline of some of my favourite trumpeters – with Douglas were Paolo Fresu and Enrico Rava, both of the latter on flugelhorn. 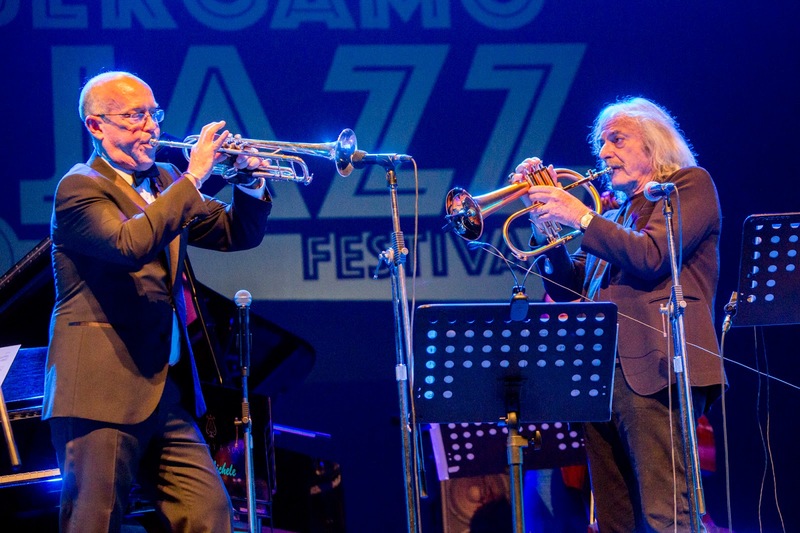 The line-up was also remarkable for including four directors of Bergamo Jazz – Caine, Fresu, Rava and Douglas in chronological order. "What did you say your name was, son?" Douglas asked Rava, his senior, when introducing them. Linda Oh was on bass and Clarence Penn on drums. Most compositions were by Douglas. The opening number was his rock-rhythm Invocation, in which the leader blasted a solo. Demigods was written for Carla Bley and Steve Swallow, and featured special guest – Jeremy Pelt. Finally, on JFK – The Airport, a saxophonist joined the band – Greg Ward. Tenorist Tino Tracanna joined for Paolo Fresu's Un Tema Per Roma – a fine composition, dark, driving and rather monochrome, and the highlight of the set. In a minor key, a little reminiscent of Ellington's Koko in its misterioso mood, it's from his new album, Carpe Diem on Tuk. In a press conference on the final night, we learned that the audience for the main concerts was 1000 for Maceo Parker, 900 for a Latin Jazz night, and 1200 for Dave Douglas-Uri Caine – these are remarkable given the temporary change of venue to Teatro Creberg, due to the renovation of the Teatro Donizetti. When the other concerts are added in, it's clear that the festival is thriving.